Who would've thought it? The maverick eminence grise of independent cinema, Gus Van Sant, brings us a pretty conventional biopic in Milk. Long attached to a film biography, in one form or another, of the martyred San Francisco City supervisor Harvey Milk, Van Sant has finally been able to direct this ambitious project. Starring as Milk is Sean Penn (Mystic River), a perfect piece of casting, in my opinion. But with the stars finally aligned for the production to go forward, why did the usually unpredictable Van Sant decide to play it straight? The film covers Milk's rise to political office in 70's San Francisco, where he became the state's first openly gay elected public official. A mildly closeted New Yorker, he slowly makes the transition to out-and-proud as a result of the prevailing countercultural influence, and his involvement with Scott Smith (James Franco), the film posits. But his entry into the political arena, and the attendant public attention, alienates Smith. A subsequent depressive boyfriend, Jack Lira (Diego Luna), is so distraught at having to share Milk with the increasingly powerful LGBT political movement that he soon hangs himself. Yet, as messy as his personal life was, Milk's political life (save for an alarming amount of death threats) continued to unfold relatively successfully, with Milk spearheading a campaign against the Briggs Initiative or Proposition 6. Proposition 6 would have required the firing of any teacher known to be gay or support gay causes. Winning the campaign, and political allies such as Mayor George Moscone (Victor Garber), proved to be something Milk was a natural at. Fellow supervisor Dan White (Josh Brolin), a lone conservative on a board of liberals, became embroiled in controversy after resigning his post as supervisor, and then trying to regain his job back. Blaming Milk and Moscone for ostracizing him from the board, he shot and killed them in November, 1978. The performances are all over the map. Penn perfectly captures Milk's congenial spirit that endeared him to so many. This may be Penn's most likable role since Spicoli in Fast Times at Ridgemont High. Brolin (W.) is also excellent at conveying the paranoia, and perhaps repressed homosexuality, that drives White to commit his brutal crimes. Others like Luna (Y tu mamá también), and Emile Hirsch (Speed Racer) as fellow activist Cleve Jones, are way over the top. Their flamboyance in their respective roles borders on offensive caricature. Franco (Pineapple Express), however, brings an earnest sensitivity to his role that should help display some of the versatility and range this underrated actor is capable of. Van Sant's film often plays like a gay Mr. Smith Goes to Washington. the director opts to use traditional narrative techniques like montages and pop music to advance his story in a relatively trite manner. Stock shots found in political films are rehashed here again, with Harvey's small frame often dwarfed even further in shots accentuating the grandiose halls of the surrounding city hall. This is no doubt to identify Milk as the Capraesque little man fighting against the entrenched establishment. It would not be exaggerating to propose that this may be Van Sant's most mainstream picture since Finding Forrester. Milk has now become a rallying point for the LGBT community with the passing of California's Proposition 8. The irony is that it has been rumored that Focus Features chose to hold the film's release back until after the elections to avoid polarizing audiences against it. 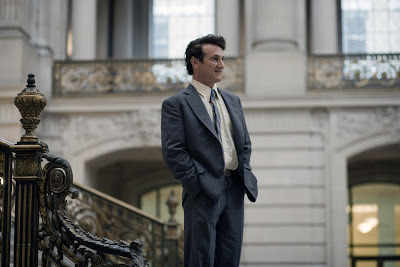 So though it may be disappointing, it is not entirely surprising that the usually avant-garde Van Sant chose a rather orthodox biopic format to tell the story of the flamboyantly controversial Harvey Milk. The film is not bad. Watch it garner a number of nominations in the upcoming awards season. But it definitely lacks the distinctive impact that Milk has had even after his death.